The SCTI group ensures support throughout its client’s development process. Our R&D approach supports the client’s technical specifications that set the terms for the scope of the research. Next comes the study and the calculation phase allowing to proportion the part and to select the best suited material, in compliance with the bureau of methods in order to obtain the best technological-economical compromise. 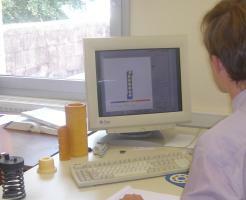 Prototypes can then be produced and tested in order to validate the actual behaviour. Finally, the bureau of methods designs the equipment allowing for the mass-production.